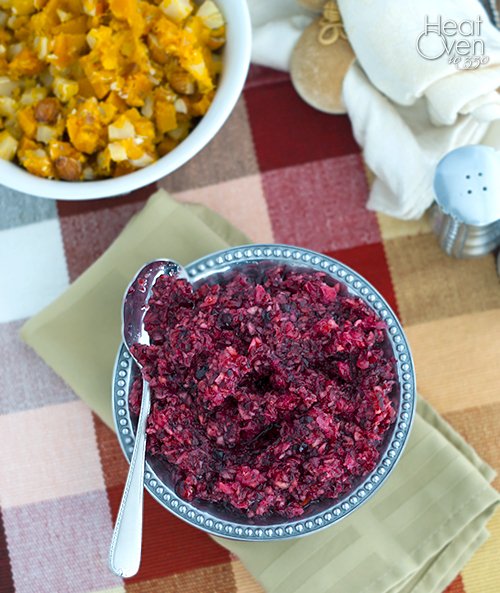 Cranberry relish, where have you been all my life? How could I have not known about you until now? I knew about canned cranberry sauce, and homemade cranberry sauce, but a no-cook cranberry side dish that is even better than either of these options? I feel like I've been cheated that I'm only finding out about this now. Thankfully, a sweet reader fixed this sad omission in my life when she sent me this recipe last week along with a few other family favorites. I was so intrigued by such an easy cranberry recipe I think I went to the grocery store for cranberries that very day. It seemed too easy to be good, but it is, my friends, oh it is. It is packed with orange and cranberry flavor, not too sweet, and perfect to serve with turkey or any other meat. I will admit that I occasionally sneak a spoonful of the stuff out of the bowl in the fridge and eat it plain. It is easily adaptable to your tastes - you can add more sugar if you want more sweetness or cut back on the orange zest if you want less orange flavor. Plus it is one of those dishes that tastes even better after sitting in the fridge for a day so it easy to have made up before the chaos of Thanksgiving arrives. 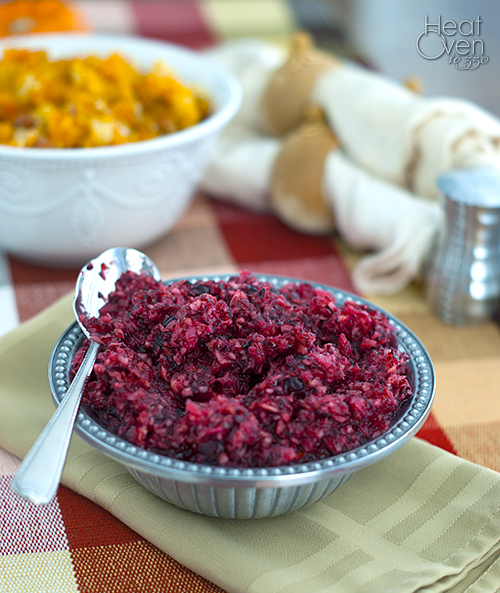 Once the Thanksgiving turkey is gone, there are still plenty of ways to use the rest of the cranberry relish. (Or to have an excuse to make a new batch.) You can use it as a spread on sandwiches, bake into a quick bread, waffles or pancakes, use it as the fruit layer in an upside down cake, heap some on your yogurt or toast, top off a baked brie with it, or just sneak spoonfuls out of the fridge like I do until it all seems to disappear. I'm thinking this relish will be the best five minutes I spend on a Thanksgiving side dish this year. Add cranberries to a food processor or blender. Zest the orange and add the zest to the food processor, then quarter the orange and remove the rind. Add the orange quarters and sugar to the food processor. Pulse the ingredients together until finely chopped. Taste and add additional sugar according to your tastes. (I like mine a little sour.) Transfer to a bowl and refrigerate (preferably overnight) until ready to use. Recipe Source: adapted very slightly from a reader, Pamela S.
Our version has chopped walnuts in it. My uncle has also put shredded coconut in his once in a while for a little tropical sweetness. I love the creamy crunch of the nuts with the tangy cranberry! Oooh, the walnuts sound good, too. I love that it is such an easily adaptable recipe. I'll have to try some nuts in it next time. Last year we didn't have navel oranges, but did have clementines. I used the clementines, but still added some sugar. I had to add some lemon juice to get the tartness back. Next time if I use clementines, I'm leaving out the extra sugar. That's good to know. I like the relish a little tart, and often we have clementines this time of year versus oranges so I could see myself making the substitution. I've never seen anything like this, but it sounds amazing! I have a few bags of cranberries in my fridge just looking for a home and I think I just found one! Wow, it's that easy?! So few ingredients, how could I not try this. Plus, I love things that are tart. Thanks!